Southwest Art once described Ray Roberts as a native son of California. This may be the most fitting description of Ray, both his life and his art have always gravitated toward California. He was born and raised along the coast of Southern California. His love for drawing as a child grew into a passion for art, and he continued his formal studies acquiring a degree at the Arts Center Design College in Pasadena. After his graduation, Ray began work as a freelance illustrator. During the years he worked as an illustrator, Roberts pursued a relationship with Peggi Kroll, whom he had originally met at the Arts Center Design College. The two were married in 1984, and in 1985 the couple moved to the Phoenix area, where Ray set up a freelance illustration studio. Still, the magnetism of California was too strong. Soon the entire family moved to Northern California, near Yosemite National Park. The impressionistic, plein air style of Roberts oil painting perfectly captures the California landscape, both coastal and interior. His artwork has been featured in Southwest Art and Plein Air magazine. Maynard Dixon Award, Sonoran Desert Invitational. 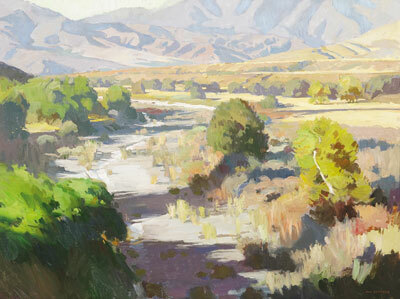 In addition to his involvement with the Laguna Plein Air Painters Association, Roberts is also affiliated with the California Art Club and was invited to join the Plein Air Painters of America in 2003. This article was excerpted from Canyon Road Arts: The Complete Visitors Guide to Arts, Dining and Santa Fe Lifestyle, Vol 1, 2005-2006, page 50. Canyon Road Arts is published by Medicine Man Gallery. All rights reserved.